If you're looking for a Joss cue with a completely different look than the standard Joss designs, you've got toe check out the JOS49. Instead of traditional curly maple, Joss has opted for Sucupira (Brazilian hardwood) to be the featured wood for this model. The Sucupira is accented with traditional lacewood points and black maple veneers. Since 1968, Joss has been at the top of pool cue making. Dan, and his son Stephen, sure know what it takes to create a beautiful pool cue that everyone is sure to love, dream of owning and hope to own one day in their life. The new JOS52 has some unique and individual black inlays that are sure to make this cue stand out at the pool hall. Everything about the design of the JOS50 pool cue is so uniquely Joss from a design perspective. You have some beautiful wood selections, perfect inlaid points and just the right amount of inlaid pearl diamonds to top it off. Notched diamond-shaped inlays of holly add a hint of brightness to the deep, rich bloodwood and ebony forearm and sleeve of the Joss JX61 pool stick. A black Irish linen wrap with white specks complements the design and adds a non-slip grip. This fantastic cue exudes quality, from its hard triangle tip and shorter taper hardrock maple shaft to its stainless steel collar and joint for a stiff hit. 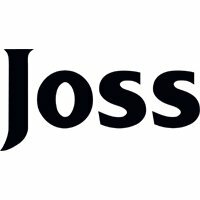 From its hard triangle tip to its durable Herculite plate, the Joss JOS20 pool cue represents the values of old-time cue making synonymous with this family owned and operated company. The hardrock maple shaft on this cue has a shorter taper and a thicker shaft, which, coupled with the stainless steel joint, provides a stiff hit. The sleek appearance of the Joss JOS14 cue stick is achieved by the use of black stained Maple on the forearm and ebony on the sleeve. Beautiful inlays of white holly lines and mother of pearl diamond shapes adorn the sleeve. A black and white Irish linen wrap complements the design.